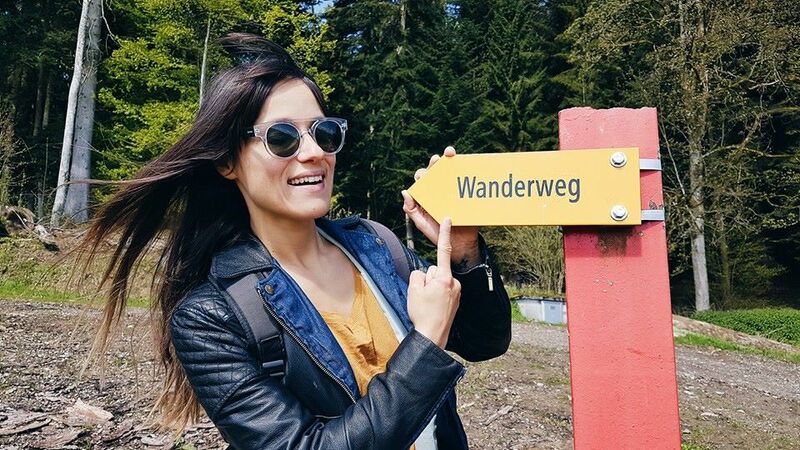 In my previous blogpost about Switzerland, I visited the city of Bern and it’s surroundings. It was time to continue my roadtrip through this stunning country. It was time to find my inner Heidi and walk through the hills. 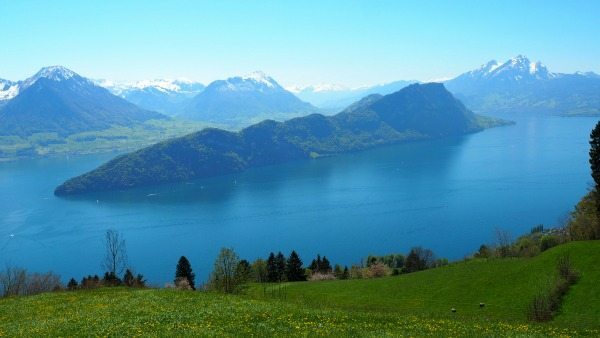 We decided to continue our way up to Emmental and Lucerne. 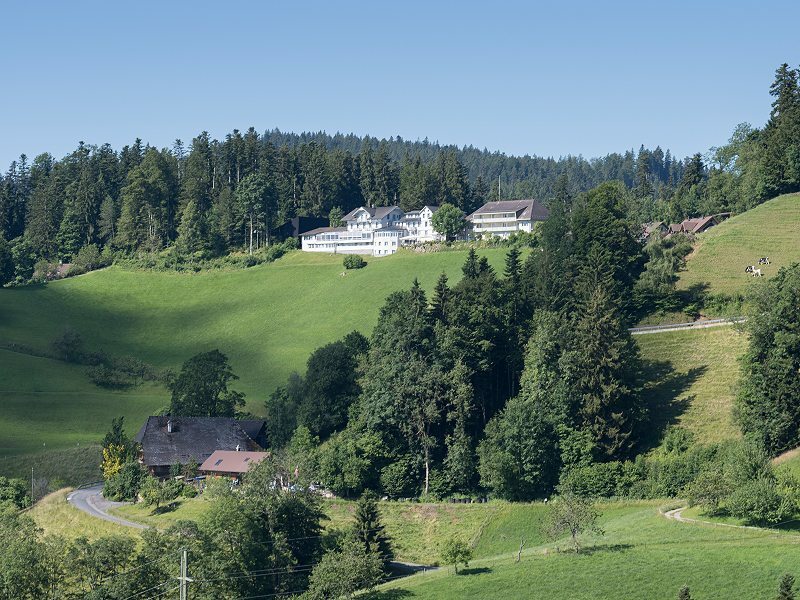 This region is made up out of small 42 villages situated between the green (or snowy) hills of Switzerland. Emmental got it’s name from the Emme river that flows through the area but Emmental is most famous for the cheese with all the holes in it. As you might know, I’m trying to cut down of animal products like cheese and I hadn’t eaten it for a while. The main reason for this is that many cows are treated in a bad way. They spend their lives inside a barn and used as a milk machine. I saw something a little different here. The cows looked happy. They jumped and skipped around like there was no tomorrow and I ate my first bit of cheese after a long while. Somehow I felt OK with that over here. I started my tour through Emmental after a meeting with the pr manager of Emmental Tourism. She took me on a hike through the hills and although it rained a little when I arrived but that didn’t stop us from walking to a great viewing point. Fun Fact! 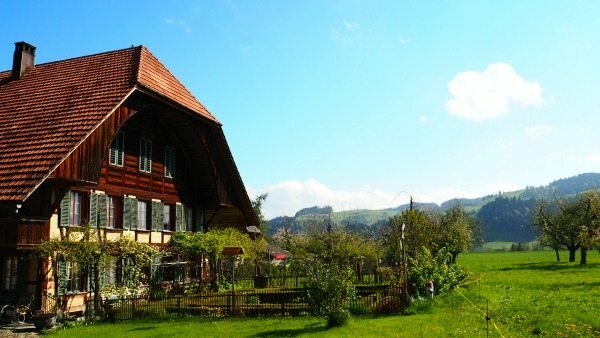 In Emmental it’s very common to see a small house right next to a larger house. This is when the children take over the farm and the parents move into a smaller house right next door! My accommodation was pretty cool. 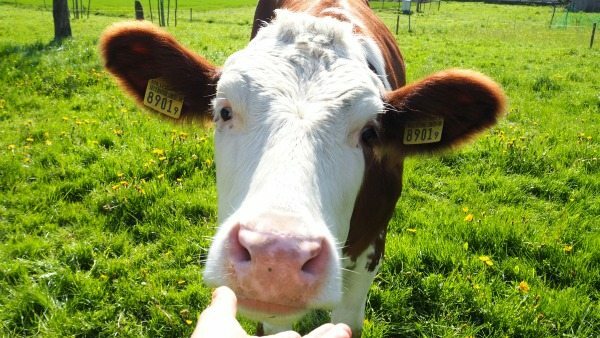 I stayed in a bed & breakfast in an old farmhouse owned by a dairy farmer and his wife, Evelyn & Ernst. I love B&B’s because it’s so much more personal than a large hotel for example. My room was large and on the top floor. The whole floor was pretty much mine to use which also featured a nice bathroom, TV room and children’s bedroom. We were asked to join dinner downstairs and because I am a vegetarian, they especially prepared some wonderful salads. 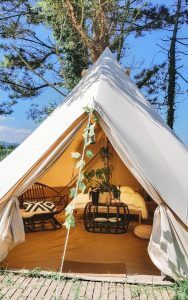 Book your stay at the farm here. If you visit Switzerland, be prepared to walk a few miles. Not because you have to but because you want to. There are so many beautiful viewing points and hills to climb, that you should definitely leave your heels at home. So the next day, when the natural alarm clock woke me up (read: Cow’s moo-ing), I was ready for a hike. The weather was beautiful and I walked from the farm through the forest and all the way up to where I can imagine Heidi running around in between te flowers. (I couldn’t help myself of doing the same, check the after movie!) Passing by little piglets, running (happy) cows and stunning views, we walked all the way up to a hotel/restaurant called Moosegg where we had an amazing lunch. Asparagus are in season so during my Swiss trip, I was eating these veggies by the dozen. 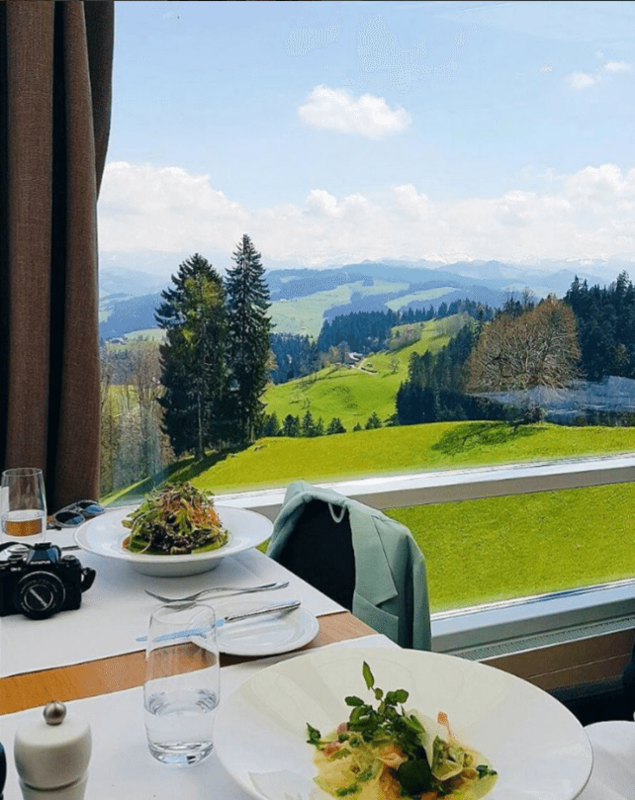 At Moosegg you enjoy a stunning panoramic view of the Emmental and Langnau hills plus on a clear day you can see the Swiss Alps in the background. The restaurant’s chef took the time to explain that they’ve just finished a new renovation of the hotel, which has 22 rooms. Chef Daniel is a highly acclaimed chef which earned the restaurant it’s 16 awarded Gault Millau points. From Emmental you can drive in several directions but we decided to drive towards Lutzern. (Lucerne) We avoided the highway again and drove through the cutest villages and green hills. The weather was sunny and this makes Switzerland even better. 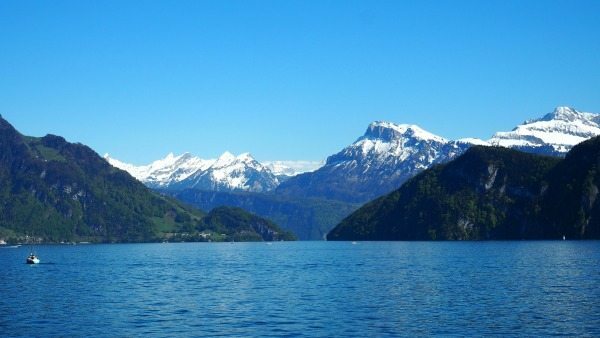 When you arrive in Vitznau you will drive pass Lake Lucerne which is surrounded by mountains and is really impressive to see. Apon arrival, we parked our car and took the Rigi rails up Mount Rigi. This is a steep rail that runs through the area and pretty much the only way to get up the mountain. 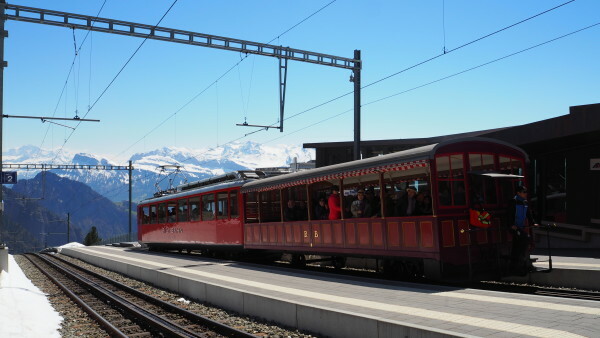 Reaching a height of 1,752 metres, the Rigi Railways are the highest standard gauge railway in Europe. The higher you get, the more snow you will see. After 5 stops we arrived at our accommodation, Hotel Rigi Kaltbad. Rooms are simple but the views are stunning. From green hills to snowy mountains within a few hours! 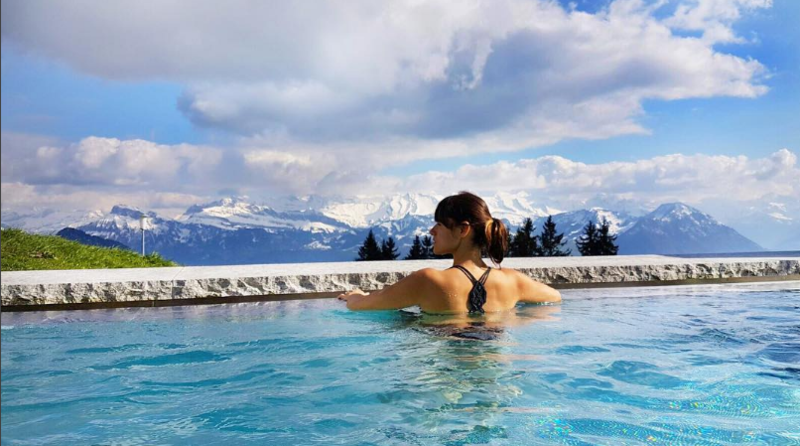 Hotel Rigi Kaltbad has a spa which hotel guest can use and I couldn’t pass on this option of course! Enjoy an in and outside area with a view of the snowy mountains. This area is a lot more expensive than Emmental so don’t be shocked when you order lunch or dinner around here. (a cup of tea will cost you €4,50!) 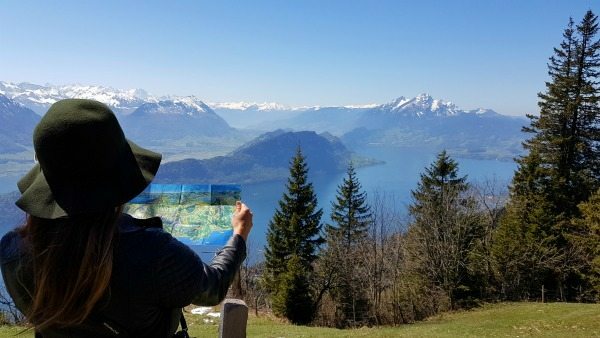 Mount Rigi is popular with hikers and lot’s of people, old and young, get up early for a fresh hike. We took the Rigi Train all the way up the top and as stupid as I was, I didn’t bring any hiking boots. God, I really needed them because there was still a lot of snow at the top of the mountain. I’d seen a few professional hikers smiling at us as they walked by thinking- “aah, cute, these amateurs”. After a few slidings and sinking into the deep snow, we made it to a new lunch place in the middle of Rigi Mount called Chalet Schild. 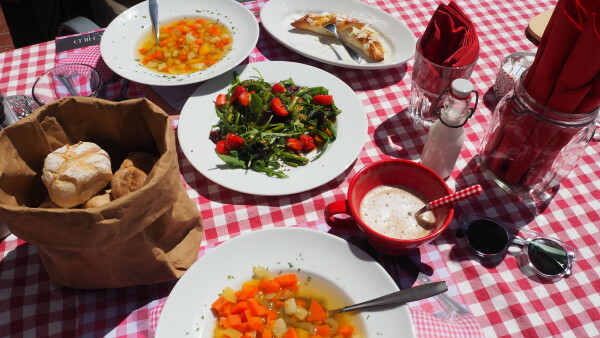 Just opened, they serve homemade salads, soup, Swiss specialties and freshly baked pastries. Travel blogger or not, when you stand here at 1700 meters above sea level, you’re gonna have yourself a cry-moment or two. From there the snow disappeared underneath our feet and we could walk on a straight path overlooking the lake of Lucerne. I had a moment of extreme gratitude and joy when I saw the view from here. It was so beautiful that I almost cried. This is the world’s true beauty. 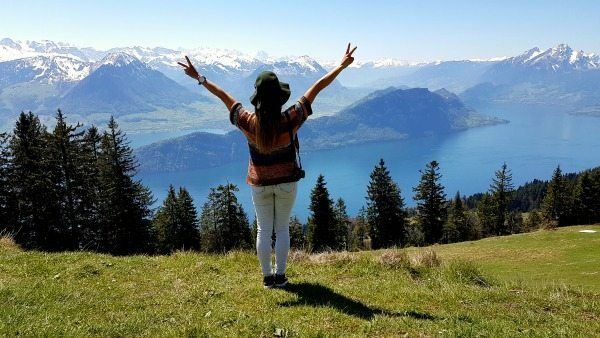 Everybody that comes here, is here to enjoy the nature of Switzerland an nothing more. Travel blogger or not, when you stand here at 1700 meters above sea level, you’re gonna have yourself a cry-moment or two. After our 2 hour hike, we got back to the hotel to pick up our stuff and take the Rigi Train back down the mountain. We still had a few hours to kill so we decided to take a boat tour over the lake. Boat tickets are available from the ticket desks at the boat docks along the lake. You get a discount or even free travel if you own a rail pass. A ticket will cost you around €20,- and takes you from Vitznau to Lucerne and back. Our car was parked back in Vitznau so we needed to go back but otherwise it’s nice to spend a few hours in high end city Lucerne. The last few days in Switzerland really took my breath away and just imagine it in a few months when everything is even greener! I can highly recommend to grab your car or train and visit Switzerland this summer! Watch the after movie here!